Poltergeist is an early '80s classic, perfectly updating the well-worn haunted house theme. It pulls the audience into the carefree world of a Spielbergian suburban family whose contented life is violently shaken by restless spirits. With great detail and craft the spooky phenomena start to increase. The malicious ghosts communicate through the TV static with the family's youngest daughter, the cute, blonde Carol Anne, and steal her away to the other side (which squashes the logical move to just get the hell out!). With the help of a psychic the parents fight to get her back. 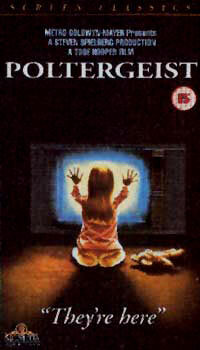 Poltergeist emanates such a great atmosphere and contain immortal scary moments (like the tree coming to life), and together with its innovative effects of the time (still totally credible today), its ample cool scene and engaging writing, 23 years (at the time of this review in 2005) it still packs a punch over all of its imitators. PS. The kids are great in this Steven Spielberg production, which accounts a lot for the visual mood reminiscent to his work.